This funny little tin house is a throwback to an earlier time — one before houses were automatically assigned a wide-open, roofed, cement-floored siamese twin known as a ‘garage’. 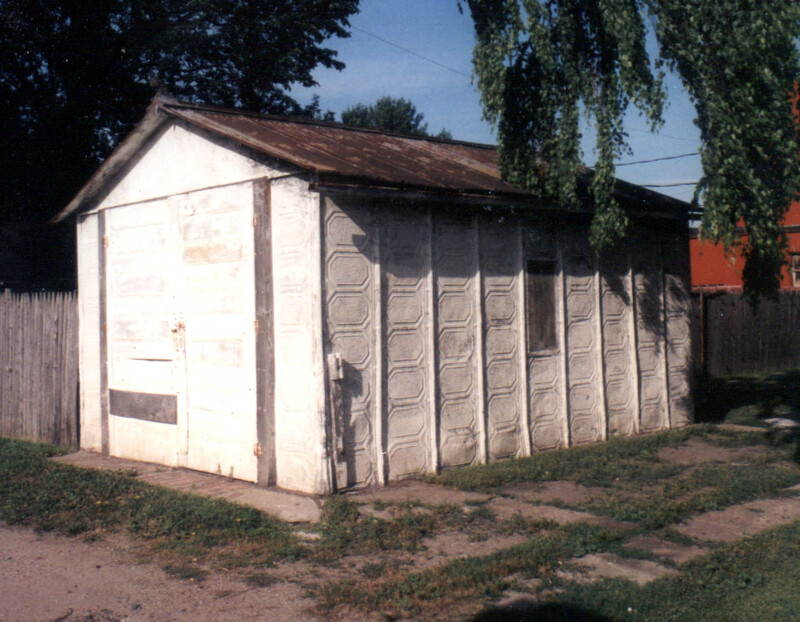 When people started buying cars they needed someplace to put them, and one of the competitors in the ‘automobile storage kit’ was the Rusk Auto-House, an overtly-fancy steel shed that owes its beauty to its Fargo-based manufacturer: a producer of embossed tin ceilings and copper cornices. Sadly, the metal shortages of the World Wars put an end to tin ceilings, copper cornices, and, as you might guess, stylish little steel car-homes. 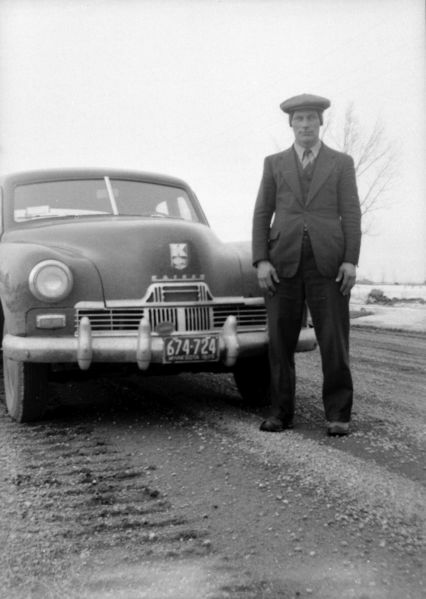 My great-uncle (not the guy in the picture) had a Kaiser Frazer — he owned it until he needed to clear out his farmstead, at which time the Frazer moved out to my uncle’s farm, where it has sat for almost twenty years now, progressively and slowly turning into a pile of rusty dust. Kaiser wasn’t a big manufacturer, and there weren’t a lot around, so I was rather surprised to turn up a whole bunch of pictures of another Kaiser taken within twenty miles of where my great-uncle lived. How’d that happen? Grandpa Vernon, as always, had the answer: there was a Kaiser dealer out that way, so there was ample opportunity for local farmers to buy ‘em. In the post-war booming, accompanied by REA, improved roads and transportation, and new farming techniques, farmers did pretty good for themselves, plenty enough to warrant spending a bit on a nice new car. So, as you might have noticed, I’ve been scanning and uploading more of my Early 20th Century Minnesota Farmland series — if I were more organized, I could point out the new ones better, but, sadly, there’s just so many of them. New images are primarily the last 1/4 of the Black Album, and all of the Red Album. You are currently browsing the The Infomercantile blog archives for September, 2007.